Type: BARGAINS. Detail: Kalendovsky, J. Product Code: 1901034062. 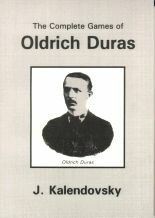 Oldrich Duras was one of the worlds leading chess players in the period leading up to the First World War and also one of its most active. A variation of the Ruy Lopez is named after him. Softback, 180 pages.